Why Haven't I Read This? Why Haven't I Watched This? I am a big Battle Royale fan, to the point that the book is my favorite book, and the movie is my favorite live action movie, so imagine my surprise when I saw a manga spin off that I never heard of called Angel’s Border, written by the original author, Koushin Takami, The BR fix I didn’t know I wanted. It’s Battle Royale! (Well, a spinoff of it...) Like the original, it tells the tale of a random 9th grade class kidnapped and forced to fight to their death by their dystopian government of the Republic of the Greater East Asia. Unlike the original that was the whole game with one main character, Angel’s Border is a more focused, more personal story of some of side characters from the original. It’s separated into two episodes, each with a different protagonist. 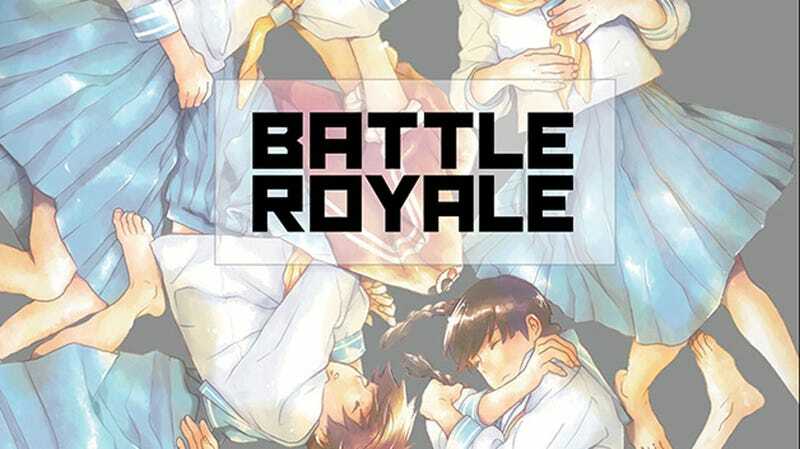 It’s Battle Royale! Being a tale of desperation and lives that were forced into a bleak situation by a dystopian government, it shows the nature of people as they are faced with a life and death situation as well as telling a deeply personal and engaging story, one that may be even better than the original in that aspect. While the original was more of a thriller story that focused on the scenario itself and situations the characters were in, this spinoff spends its time to show a more personal tale full of backstory to what we thought were extremely minor characters in the original. While the original sprinkled this in a bit, it’s nice to see more of it. It’s just really solid in general, as it’s own story. The characters were developed well, and the story they tell is solid and relatively varied thematically, showing all sorts of things from unrequited love, to life in this dystopian world and the Anti-government movement. Also, the integration between these two chapters and the original was handled surprisingly well, done gracefully while explaining something in the original that was relatively glossed over. I came out pleasantly surprised by this in almost every aspect: It was very enjoyable, and I thought that the story that BR told by itself was handled really well and didn’t really need more information, but here is more, and it’s done extremely well. Why Haven’t I Watched Read This? is an article series that I totally stole from Dxomega about shows that really catch our attention. This definitely won’t come out on any regular basis.